DataConnect offers the Full Experience with Teradata. This allows you to create queries using a tile-based drag and drop query builder. The tile-based editor functions with Teradata Provider for .NET 4.0, OLEDB and ODBC. However, automatic joins are currently only supported on Teradata Provider for .NET 4.0 based connections. We recommend using the Teradata Provider for .NET 4.0 where available. To create a new connection to a Teradata server, make sure you are on the Connections tab. Then press the (+) icon at the very left hand side of the window. You then have a choice of connection technologies. We recommend using the Teradata Provider for .NET 4.0 where possible. Select the Connection Type 'Teradata Connections'. 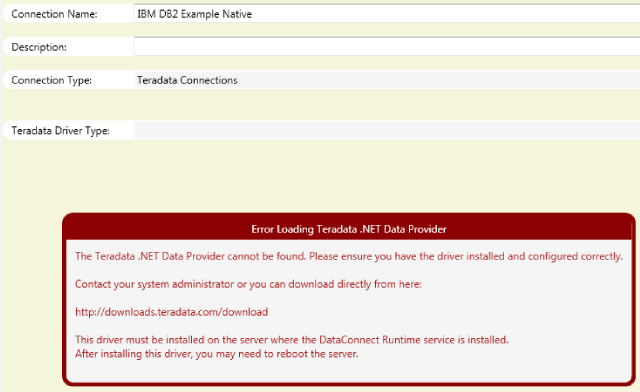 If you attempt to use the Teradata Provider for .NET 4.0 and you don't have it installed, you will receive an error directing you to the driver download location. The Teradata .NET Provider cannot be found. Please ensure you have the driver installed and configured correctly. The driver must be installed on the server where the DataConnect Runtime service is installed. Select the Connection Type 'ODBC Connections' and the Odbc Driver Type of 'Teradata Connection'. Select the Connection Type 'OLEDB Connections' and the Oledb Driver Type of 'Teradata'.